Governor Aminu Tambuwal of Sokoto State on Wednesday night held a closed- door meeting with former President Olusegun Obasanjo in his Abeokuta residence. Mr Tambuwal seeks to be president in 2019 on the platform of the opposition party, PDP. Mr Tambuwal who addressed journalists after the meeting which lasted for about 50 minutes and ended few minutes to 9.p.m. said he was in Abeokuta to consult with Mr Obasanjo in respect of the 2019 polls. "Obasanjo is one of the critical leaders of the country and it is necessary for me to consult with him concerning the 2019 polls, particularly on my aspiration to contest for the presidency of Nigeria." Mr Obasanjo who led Nigeria on the PDP platform (1999-2007) left the party in the build up to the 2015 general election. Although he supported President Muhammadu Buhari then, he has since fallen out with the president and is working against his re-election. Mr Tambuwal also urged political gladiators not to make the 2019 election a matter of "do or die". He described the clamour by the youths for increased participation in the governance process in Nigeria as " justified" considering the high percentage of their population in the country. Mr Tambuwal called on the present leadership to accord them more opportunities to participate in governance process. 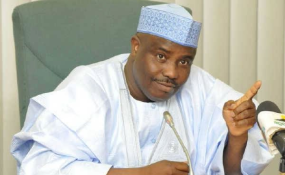 The Sokoto governor is one of the leading aspirants for the presidential ticket of the opposition party, PDP. He is believed to enjoy the support of Rivers State Governor, Nyesom Wike, who has a huge influence in the PDP and was able to influence the choice of Port Harcourt as venue of the party's presidential primary. The PDP presidential primary holds in the Rivers State capital on Saturday and Sunday.